SCP series refers to the supercapacitor cell whose capacity ranges from 650F to 5000F. According to different terminal design, two series such as STA、 WLH are avilable. SCP sreies ultracaps are used in areas where energy is needed. eg automotive, wind power generation, rail transportation, heavy duty machinery, micro grid, industrial backup power supply, and robot, etc. In order to improve the voltage class in use, SCP series ultracapacitor are usually connected by series connection; different series require different connections. The soldering pillar cell are usually connected with welding laser in serial or parallel. The external thread type can be connected by bolts, the torque should be controlled at 14 + 2N * M.
“The SPSCAP Super capacitor has low internal resistance, and it could achieve fast charge storage and release both on the electrode/solution interface and the body of the electrode materials. As it has an output power density of as high as KW/kg, it is unmatched by any of the chemical power source, and is 10 times in power storage capability than normal battery. 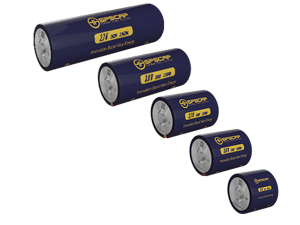 “SCP series includes SPS’ largest capacitor, SCP5000C0-0002R7WLH of which nominal capacitor is 5000F.Because of large current in discharge——Little loss of power during the discharge process, large current which is dozens of times than that of the battery.SCP series also is a ideal power supply for Locomotive engine startup system.